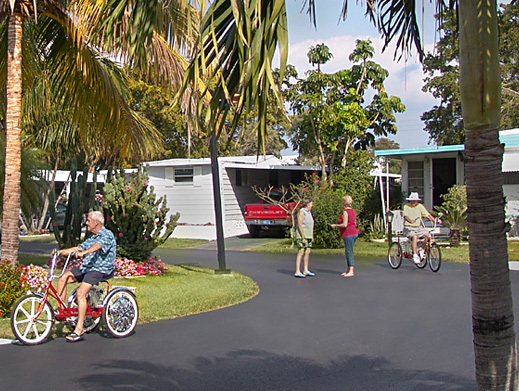 manufactured housing community in Florida. Unique opportunity to own a BRAND NEW home in Golf View Estates. Please call the office for more information. Prices marked are owned by Golf View Estates. Homes are shown by appointment only by calling (954) 972-4140. Homes owned by Golf View Estates, addresses are highlighted in yellow. Click on home address for individual sales page. $15,000 3476 Bunker Boulevard click here to go to information page. 2/1 Single, Enclosed Florida room with A/C, New Floors, New interior paint through out, Close to Club House, New A/C. Best offer over $17,000 3507 Bunker Drive click here to go to information page. 2/2 Double, Furnished, Family development makes sale necessary. Motivated seller. Conveniently located to mail boxes, main club house, pool and hot tub. Stop by and have a look. Move in ready. Tile in kitchen, Hall bathrooms and bedrooms, Carpet in family room and Florida room, Wood floors in the dining room, Enclosed Florida room/office with AC, Roll down shutters in screen room, Impact windows throughout. Fridge, washer, dryer and grill in the enclosed Florida room. $22,000 3489 Eagle Drive click here to go to information page. $21,000 542 Golf View Boulevard click here to go to information page. 3322 Golf View Boulevard click here to go to information page. $34,500 3473 Golf View Boulevard click here to go to information page. $42,000 3492 Golf View Boulevard click here to go to information page. 2/2 Double, Wood floors in bedroom, kitchen, family room and dining room, tile in Florida room, updated bathrooms, lots of closet space, washer and dryer, shed. $18,000 798 Putter Place click here to go to information page. 2/2, Single, Enclosed Florida room, New A/C, Close to pool and Clubhouse. $46,000 809 Putter Place click here to go to information page. 2/2, Spacious Newer Home 2003, Newly painted, Wood floors throughout, 4 inch Base boards throughout, Crown molding in Living and Kitchen area, Tiled Bathrooms, Open floor plan, Enclosed FL Room, Washer and dryer inside the home. Dishwasher, 4 Ceiling fans, Shingled roof, Shed. 3435 Tee Terrace click here to go to information page. 2/2 Double, Screen FL Room, Open FL Room, Negotiable on price. 3545 Tee Terrace click here to go to information page. 2/2 Single, Split floor plan, unfurnished, enclosed FL room, wood and tile floor through-out, newer paint, move in ready.